It is fascinating that the iron rod and the sword of justice—two dualistic symbols of the word of God—seem to be linked features in Lehi’s vision of the tree of life. God’s sword of justice was associated with a filthy river and an impassible flaming gulf, and the iron rod was extending along its bank (1 Nephi 8:19). In such close and parallel proximity, each feature reinforces the dual symbolism of the other, revealing various layers of truth about the word of God. God’s word offers both guidance and firm correction (as symbolized by the rod), and the power of its truth penetrates and reveals the hearts of men, justifying the righteous and condemning the wicked (as symbolized by the sword). Also, as a flaming sword, the word of God causes the hearts of the righteous to burn with love and truth,12 while for the wicked it causes them to be in a “state of awful, fearful looking for the fiery indignation of the wrath of God” (Alma 40:14).13 Understanding the contrasting nuances of these symbols can help us better understand and apply the various passages that use them. David M. Calabro, “Lehi’s Dream and the Garden of Eden,” Interpreter: A Journal of Mormon Scripture 26 (2017): 272–274. John A. Tvedtnes, “Rod and Sword as the Word of God,” in Journal of Book of Mormon Studies 5, no. 2 (1996): 148–55; reprinted in Pressing Forward with the Book of Mormon: The FARMs Updates of the 1990s, ed. John W. Welch and Melvin J. Thorne (Provo, UT: FARMS, 1999) 32–39. Corbin T. Volluz, “Lehi’s Dream of the Tree of Life: Springboard to Prophecy,” Journal of Book of Mormon Studies 2, no. 2 (1993): 29–38. 1. Instead of using “sword,” the 2013 LDS edition of the Book of Mormon has “word of the justice of the Eternal God” (emphasis added). However, the Critical Text Project has revealed that Oliver Cowdery mistook the sw in “sword” for a w when he made a copy (known as the printer’s manuscript) from the original manuscript. According to Royal Skousen, “There are no other examples of ‘the word of justice’ in the Book of Mormon, but there are seven other examples of ‘the sword of justice’.” Royal Skousen, Analysis of Textual Variants: Part 1: 1Nephi–2 Nephi 10 (Provo, UT: FARMS, 2014), 258. Thus, manuscript evidence and consistent usage both indicate that “word” should be “sword” in this verse. 2. See also, 1 Nephi 16:2; 2 Nephi 1:26; Words of Mormon 1:17; Mosiah 13:7; Alma 1:7; 3 Nephi 11:3; Moroni 9:4. 3. John A. Tvedtnes, “Rod and Sword as the Word of God,” in Journal of Book of Mormon Studies 5, no. 2 (1996): 148–55; reprinted in Pressing Forward with the Book of Mormon: The FARMs Updates of the 1990s, ed. John W. Welch and Melvin J. Thorne (Provo, UT: FARMS, 1999) 32–39. 4. See also, Ezekiel 21:9–10, 13; Revelation 2:16, 27. 5. Tvedtnes, “Rod and Sword as the Word of God,” in Pressing Forward, 33. 6. 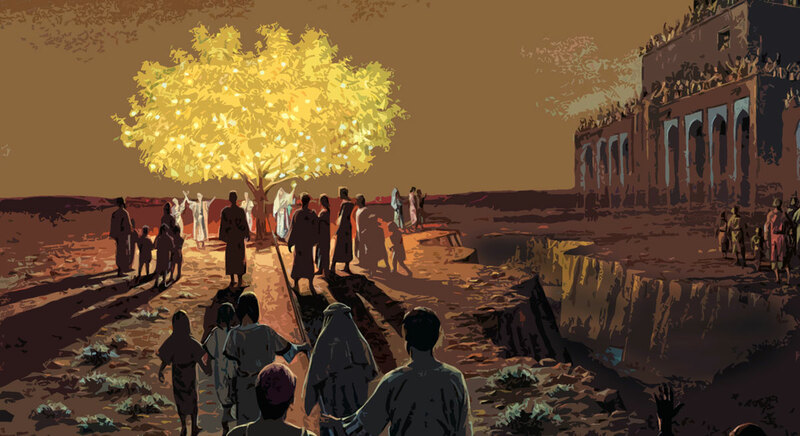 The tree of life in Lehi’s dream shares a number of parallels with the tree of life in the Garden of Eden—including the presence of water in both accounts. See David M. Calabro, “Lehi’s Dream and the Garden of Eden,” Interpreter: A Journal of Mormon Scripture 26 (2017): 269–296; Book of Mormon Central, “Why We Still Have to Cling to the Iron Rod Even Though the Path is Strait (1 Nephi 8:13–14),” KnoWhy 402 (January 25, 2018). 7. Margret Barker has noted that this dual symbolism can also be seen in different translations of Psalm 2: “In the Bible, the rod of iron is mentioned four times as the rod of the Messiah. Each mention in the King James Version says the Messiah uses the rod to ‘break’ the nations (Psalm 2:9) or to ‘rule’ them (Revelation 2:27; 12:5; 19:15). The ancient Greek translation (the Septuagint) is significantly different; it understood the Hebrew word in Psalm 2:9 to mean ‘shepherd’ and it reads, ‘He will shepherd them with a rod of iron.’ The two Hebrew verbs for ‘break’ and ‘shepherd, pasture, tend, lead’ look very similar and in some forms are identical.” Margret Barker, “Joseph Smith and Preexilic Israelite Religion,” in The Worlds of Joseph Smith, ed. John W. Welch (Provo, UT: Brigham Young University, 2006), 76–77. 8. See also, Doctrine and Covenants 6:2; 11:2; 12:2; 14:2; 33:1. 9. See also, 2 Nephi 9:16. Nephi’s use of “cutteth” here is good evidence that he is referring back to the symbol of the “sword of the justice of the Eternal God” from his vision. Nephi explained to his brothers that the “awful gulf, which separated the wicked from the tree of life” (1 Nephi 15:28) was a symbol of the “justice of God [which] did also divide the wicked from the righteous; and the brightness thereof was like unto the brightness of a flaming fire” (1 Nephi 15:30).The flaming sword of justice which created an impassible gulf between the wicked and the righteous in Lehi’s dream seems to be clearly analogous to the “flaming sword” which separated Adam and Eve from the Tree of life (Genesis 3:24). This imagery is referred to several times in the Book of Mormon. See Alma 12:21; 42:2–3. For further connections between these symbols, see Corbin T. Volluz, “Lehi’s Dream of the Tree of Life: Springboard to Prophecy,” Journal of Book of Mormon Studies 2, no. 2 (1993): 34–35; David M. Calabro, “Lehi’s Dream and the Garden of Eden,” Interpreter: A Journal of Mormon Scripture 26 (2017): 272–274. 11. This concept of justice is rather different from our modern understanding, which hearkens more closely to the Egyptian symbolism of a set of scales weighing the heart—as if God's judgment were a commercial transaction. For ancient Israel, justice was more about who was on the Lord’s side (see Joshua 24:15). Those not faithful to covenant obligations were divided or separated by divine justice from those who were faithful. 12. See Helaman 5:23–24, 44; 3 Nephi 11:3; Luke 24:32; Doctrine and Covenants 9:8. 13. Emphasis added. See also, Jacob 6:10; Mosiah 3:27; Moroni 9:5; Proverbs 6:27–28. 14. Tvedtnes, “Rod and Sword as the Word of God,” in Pressing Forward, 38.